Charles Slack born in Duffield, Derbyshire in 18982, the second of three children, all sons, of Charles (b. 1871, Bradley, Derbyshire) and Augusta Slack (b. 1872, Newhall, Derbyshire née Draper)3. By 1901, he and his wife and their then two children were living at 46 Allestree Street, Derby with Charles senior working as an iron moulder's labourer4. By 1910, when their third child was born, Charles and his family moved to Beeston and, in 1911, they were living at 7 Dagma Grove. Charles senior was working as a foundry labourer, probably at the nearby Beeston Foundry. The 13-year-old Charles was still at school while his 14-year-old brother had started work as an errand boy5. From 1916 onwards, conscription into the armed forces had become compulsory for all single men when reaching the age of 18, and they would then be eligible to be sent abroad on reaching age 19. Accordingly, Percy should have enlisted in March 1916 but, for some reason, seems to have done so in December 1916, with the Lincolnshire Regiment6. Although we do not have a date on which he arrived in France it is likely that it was in March 1917 when he was aged 19 or shortly afterwards, when he completed his basic training and joined 1st Battalion, part of 62nd Brigade of 21st Division. This arrival would have coincided with the last days of the pursuit of German Retreat to the Hindenburg Line during which time the Battalion was able to carry out training and consolidation of its new position before resuming attacks against the enemy's new position in the Battle of the Scarpe in April, when snow meant difficult conditions for the men, and into May, when heavy rain was a constant problem. At the end of July the Third Battle of Ypres - known as Passchendaele - was launched against the enemy, when heavy rain again brought terrible conditions and heavy casualties. In the early stages, 1st Battalion was involved only in support or in peripheral roles but this changed at the end of September when it took a full part in the Battle of Polygon Wood when it faced extremely heavy artillery fire and incurred heavy casualties. Heavy rain and the resulting deep mud were again a major problem7. These were conditions that were experienced again in the early weeks of 1918 when, at some times, the men occupied trenches with knee-deep mud and drenched surroundings which made maintenance difficult if not impossible. On 21st March the enemy launched its Spring Offensive from the Hindenburg Line with the objective of ending the war before American troops and resources could tilt the balance towards the Allies. The battalion was involved from the start, facing heavy enemy bombardments and an attack against the Battalion Headquarters forced its evacuation. The battalion's various companies managed to hold throughout despite heavy and consistent enemy attacks until it was relieved by South African troops at the end of a very difficult day. On the following day, the battalion was ordered to retire to a line that was found to be only partially prepared with the exhausted men forced to push themselves to extremes. Another withdrawal was ordered for the next day and eventually it was possible to take a stand but not before the Battalion had taken heavy casualties such that a period of consolidation and reorganisation was necessary. The Battalion faced further heavy enemy attacks at the end of May when, after holding its position for some time was eventually forced to withdraw, but in good order. This process was destined to be repeated the next day until orders were received to withdraw to high ground but with greatly diminished numbers, unable to provide the resources demanded by their subsequent orders. In this chaotic position, a group of the remaining men were seconded elsewhere, leaving a small group of 40 men under an officer remaining, a position that was at least partly rectified, in mid-June, by the arrival of a draft of 304 men and a six officers that had mainly transferred from 2/5th Battalion as well as the return of the seconded men. A period of reorganisation followed as the German Offensive petered out. It had been a difficult and close-run time. On 8th August 1918, what became known as the Battle of Amiens began, the beginning of what became known as the Allies' Hundred Days Offensive which was eventually to end the First World War. 1st Battalion was in trenches at Mailly Maillet, north of Albert and attacked on 21st August and continued fighting over the next week, largely reaching its objectives but with substantial casualties - 9 Officers and 217 Other Ranks. The battalion continued the advance on 7 September from trenches at Rocquigny, meeting stiff resistance but managing to beat off enemy counter-attacks but, again, with substantial casualties. An attack on the 18th behind a creeping barrage, was completely successful with all objectives taken and 150 prisoners taken but with casualties of its own of 1 Officer and 95 Other Ranks. Sadly, on the 26th, after the Battalion had moved to Gouzeaucourt, Private Slack was killed8 and was buried in the battlefield. After the Armistice, his body was exhumed and reburied nearby in Gouzeaucourt New British Cemetery9. At some point during his time on the Western Front, he had been awarded the Military Medal for his bravery in action10. Gouzeaucourt is a large village 15 kilometres south west of Cambrai and 15 kilometres north-east of Peronne. The village was captured by the 8th Division on the night of 12-13 April 1917. It was lost on 30 November 1917 in the German counterattack at the end of the Battle of Cambrai, and recaptured the same day by the 1st Irish Guards. It was lost again on 22 March 1918, attacked by the 38th (Welsh) Division on the following 18 September, and finally retaken by the 21st Division on 8 October. 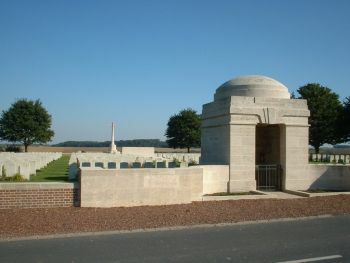 The cemetery was begun in November 1917, taken over by the Germans in 1918, and used again by Commonwealth forces in September and October 1918, but the original burials (now in Plot III) are only 55 in number. It was enlarged after the Armistice when graves were brought in from other cemeteries and from the battlefield of Cambrai. The cemetery now contains 1,295 burials and commemorations of the First World War. 381 of the burials are unidentified11. Private Slack was posthumously awarded the British War Medal and the Victory Medal12. His financial effects of £16 18s 10d, which included his War Gratuity of £10, were paid to his father on 20 May 1919.13. His parents continued to live at 7 Dagma Grove, apparently for the remainder of their lives. Both of Charles's brothers married and lived and worked for much of their lives in Beeston. Augusta, Charles's mother, died in 1942, aged 6914. 2His birth date of 13 March 1898 was recorded in the Register when he was baptised at Duffield, Derbyshire on 22 May 1898. 3They were married at Quarndon, Derbyshire on 4 July 1896. 5Beeston, Notts: 1911 Census, Piece 20432, RD429, SD3, ED7, Sched 226. Charles's siblings were Albert (1896-1986) and Frank (b. 1910). 6As his Army Service Record has not survived but the amount of his War Gratuity can be used to calculate the month of enlistment. Although no documentary evidence has been found it is possible, evidenced by his Service Number, that his training was with the Sherwood Foresters. 7Details the battalion's deployment in 1917 and 1918 are summarised from the battalion war diary. 8Ironically, after all the action that Private Slack had seen, the battalion war diary recorded 'The day was uneventful' on the 26th September. 9The position of Private Slack's original burial and its subsequent move are recorded on a Burial Return linked to his entry on the Commonwealth War Graves Commission website. 10No mention of this award has been found in the battalion war diary or in the London Gazette. 12Details from Charles's Medal Card and his Medal Roll entry - available on ancestry.com. 13Details from his entry in the Army Register of Soldiers' Effects, 1901-1929 - available on ancestry.com. 14Family details are from standard genealogical sources, including the Registration of September 1939.